This is one of those movies that I sought out simply because of it's star. In this case it was my hero Patrick McGoohan, the creator and star of the greatest T.V. program ever, 'The Prisoner'. Though McGoohan himself was once quoted as saying, "I've made an awful lot of crap", that hasn't stopped me from attempting to uncover some of his hard to find titles. This one in particular caught my eye as he plays opposite long time Clint Eastwood nemisis, Lee Van Cleef (ironically this was the same year that McGoohan played opposite Eastwood in Escape From Alcatraz, so there is a circular feeling to the whole thing). Set in Scotland. 'The Hard Way' introduces McGoohan as John Conner, a hitman who out of the blue, wishes to retire. Van Cleef plays McNeal, who blackmails him into doing one last, difficult job by threatening to kill his wife, Kathleen (Edna O'Brien) for leverage. Initially agreeing, Conner decides to turn on his boss and kills a pair of hitmen in the process, setting off an intense cat and mouse adventure which ends in a booby trapped mansion. 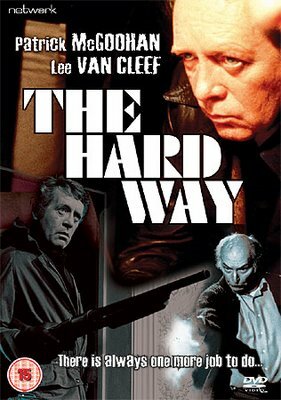 A quiet, compelling, intensely moody little film, 'The Hard Way' plays not unlike a Jean Pierre Melville pic. The dialogue is extremely sparse and the quietness is often deafening. When you have two supreme character acters like McGoohan and Van Cleef, often the less said, the better. A tremendous amount of tension is built between these two. They only share a few scenes together, but both make their feelings known whilst barely uttering a word to each other. This is more pulverizing than any big shootout could have been. And when the action does finally come, it is teeth grindingly tense. One of the most unusual aspects of the narrative is in the handling of the Kathleen character. O'Brien's scenes feature her talking directly into the camera as if she were telling the audience the story of her estranged husband. Through her, we learn that they have two children living happily in America and that Conner is an absentee husband who sends them money, but is never around (understandable considering his line of work). The most telling moment is when she describes her husband as never having known who he was or what he wanted to be. It is a devasting bit of dialogue that at once, reveals to us us all we need to know of our protagonist. It is little wonder why McGoohan was drawn to the role. Sadly, the movie seems to have been a troubled production as the initial director was replaced, seemingly at the last instance. Fortunately, Dryhurst (who has nary another credit to his name) reportedly saw eye to eye with McGoohan and the two worked well off one another as is evidenced in the film itself. Then, a problem arised with it's release and for reasons I'm not aware of, it became a straight to T.V. movie which quickly faded into obscuritey. It finally was released (in Europe only) to dvd thirty years after it's initial release and to little or no fanfare. This is really a shame as despite it's low budget, it's such a visually striking adventure. It's use of the Scottish countryside for it's exterior shots are wonderfully lush, yet simultaneously forboding. The scenery practically becomes a character itself. This film deserved far better initial treatment than to be relegated to a small square screen. If McGoohan is correct in his declaration that he made "an awful lot of crap', then presumably he was not referring to 'The Hard Way'; a mini masterpiece that features some of his best ever acting. Hopefully, this is a film that becomes more widely known in the coming years as it so derserves to be.